The chime of a Cupertino Marimba rouses your weary soul. After a quick peck on the cheek of your spouse, you kick off the toasty comforter (gently, your spouse is not as equally inclined to rise this early), and swing your legs to the floor. You reach over to your dresser and instinctively swipe a to-do list from the atop the pine surface, then stagger out towards the living room. You are in your living room. Or, by all visual accounts, a cookie warehouse. Your kitchen lies to the south. Dozens of cases of Girl Scout cookies form a narrow passage that blocks your way into other parts of the house. You are in the kitchen. There is naught a sliver of light from the moonless sky outside the windows. Candace sits on the counter near the sink, bathed in the eerie amber glow of a full power charge. A digital clock beams greenish numbers at you from over the microwave. You feel very much like it is 4:22am. The system whirs to life in a series of clicks and bubbling fury. You set the small keyboard on the tile counter. Oddly, you hear water steaming within Candace’s metal bodice, but no percolating. The pot is full. It is not yet hot. You feel confused, it must be 4:23am. There is nothing special about the keyboard. You find this to be utterly shocking as you are positive that last night was a typical Sunday evening. You really don’t want to do that. The cases of Girl Scout cookies in the living room collapse as you approach. You are trapped until your spouse awakens, unless you’d like to also wake your kids by screaming. >CANDACE, WHERE DID GIRL SCOUT COOKIES COME FROM? >CANDACE, WHAT HAPPENED TO MONDAY? >CANDACE, WHAT HAPPENED TO TUESDAY? You hesitate. Perhaps you should wait until Thursday and reset the table. Each box is labeled with a cryptic title. 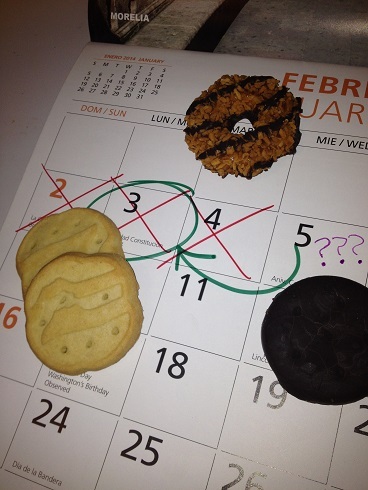 You see Thin Mints, Samoas, Tagalongs, Do-Si-Dos, Trefoils, and Savannah Smiles. >CANDICE, WHAT IS A THIN MINT? Candice’s amber light flickers as she plunges onto the internet. >CANDICE, WHAT IS A TREFOIL? >CANDICE, WHAT IS A SAVANNAH SMILE? It tastes of metallic water and bad judgement. Your fingers hesitate on the keys. Still not ready. Maybe some physical activity? >CANDICE, WHAT IS A DO-SI-DO? The dance requires a partner. You rip the machine from the wall and launch into a series of steps. The awkward coffee maker slips from your grasp and smashes on the ground. The spilled pot of coffee soaks quickly into a loose case of Thin Mints. Candace flickers in her death throes. She is beyond cookie therapy. Weak sounds emit from the bent speaker panels. You sense activity nearby as the six year old ‘Princess’ enters the room. The princess ignores your greeting, looking instead at the ruined Thin Mints. This entry was posted in Family, Life, Writing and tagged Author, Blogging, Children, Cookies, Girl Scouts, Interactive Fiction, Parenting, writing on February 5, 2014 by cordellfalk. All that before 5am. Well done, sir, well done. Now get thee to a coffee shop and caffeinate thyself heartily.